For the 2015 season I am offering extraction by appointment. 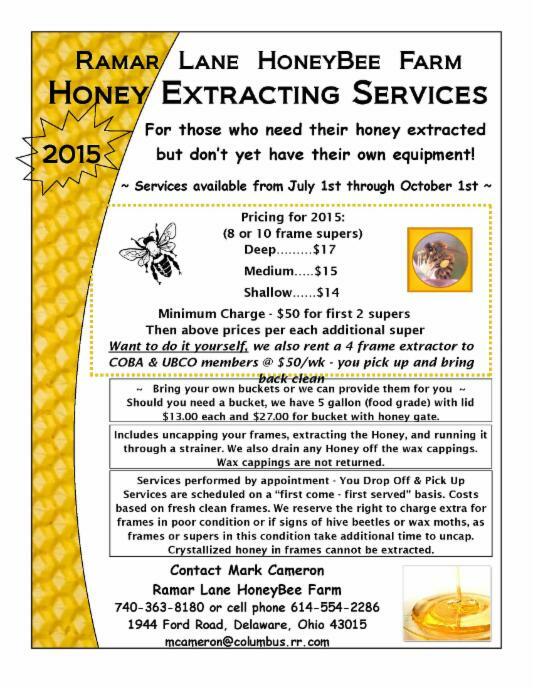 And new for this season I am also renting out a 4 frame extractor to COBA (Central Ohio Beekeepers Association) and UBCO (Urban Beekeepers of Central Ohio) members who wish to extract their honey on their own. The extractor is stainless steel, hand operated, and capable of four frames, deeps, mediums, or shallows. $50 per week, Saturday to Saturday. Pick up after noon on a Saturday and return by 10 am the following Saturday. Pick it up clean and return it clean. Mesh screens, knifes, uncapping bucket can also be rented as needed. Deposit is required, and this is limited to COBA & UBCO members only. Must present a valid & current COBA or UBCO membership card. Please call for more information if interested. The extracting season typically runs from July through the end of September. Unless we have an unusually warm fall it just makes it more difficult to extract honey from the frames. And should September become colder than usual we may have to suspend our extracting. Please feel free to call anytime to see if we are extracting. Please contact us for more information on extracting or to set an appointment. Based on the extracting load I may not be able to schedule extracting for you any sooner than 48 hours from the time you call. Please see our pricing for 2015 above. · If you bring in just 2 medium supers the cost is $50. · If you bring in 4 medium supers the cost is $50 + $30. · If you bring in more mediums then the cost remains $50 for the first 2 and $15 for each additional medium super. · Note that the same calculations shown above apply for any combination of mediums, shallows, and/or deeps. The more supers you bring in, the more cost effective it is! Normally you can figure (on average) that you will get about five gallons of honey for each two 10 frame mediums or single deep - as long as all frames are full. · Five gallons of honey weighs 60 pounds. · Five mediums will yield from 12 to 15 gallons of honey, or 144 to 180 lbs. · If you were to bring in five mediums it costs you about 60 to 48 cents a pound. · If you only bring in one medium, well, that's not going to be very cost effective, as it ends up at over $1.70 per pound. This is an estimation for example purposes only, results vary due to the amount of honey in each super! We have set up our pricing and minimum charge because of the time it takes to set up and complete the process for each customer. We clean our equipment and filters between each customer and that ends up taking quite a bit of time and work. Also, you'll need 5 gallon buckets (clean food-grade plastic) with lids. In case you don't have any or need to buy them, we have them at $13 each with the lid. If you want them with honey gates, which makes it much easier to fill honey jars, we sell the buckets with honey gates for $27. You'll need one to two buckets per every 2 mediums or per each deep. As an example, one recent extraction of 2 full medium honey supers yielded 7.5 gallons, which required 2 - 5 gallon buckets. I strain all my extractions through Stainless Steel, double mesh filters to remove any stray wax from un-capping (or any bee wings and legs) so you end up with clean honey. You won't need to run it through a filter when you get it home, you can go right into bottling it. Another thing to know, I don't fill the buckets all the way full. This is for 2 reasons; 1) the screen filters I use sit on top of the buckets, with the bottom of the filter resting a few inches below the top, so I stop filling before the honey comes up to the bottom of the filter; and 2), full buckets are very, very heavy, at 60 lbs for 5 gal. I don't like handling 60 lb buckets and you won't want to either! Especially if you are having to try and pour from a bucket into a bottling bucket or bottling tank. So the buckets end up at about 45 to 50 lbs. Please note that if you are a beginner and only have 1 or 2 supers you can save some money and just scoop the comb off the foundation with a spoon and place it in a strainer and let the honey drip off the comb and into a container. If you choose this route just be careful not to tear into the foundation if you are using wax foundation. When done you can put the frames right back into the hive for the bees to clean them up and start building new comb. Please don't remove the supers more than 2 to 4 days prior to having the honey extracted. If you do, and you have them sitting around say in your garage, you run the risk of wax moths getting into the honey frames. Wax moths and their larvae can damage the comb, taint the honey, and make it more difficult and time consuming in removing the wax moth larvae during the extracting process. SEE PICTURES BELOW. If the frames contain wax moth larvae I reserve the right to charge for the additional time it takes attempting to remove the larvae. Besides, they are just a real hassle to both you and me, and it's best to not take a chance in having them affect your great honey! The same thing applies to hive beetles. With the supers removed there are no bees left in the super(s) to fight off the beetles and moths. One last note, it is very difficult to extract honey when some of it has crystallized in the comb. Please make sure you check your frames and supers for any issues before you bring them over for extraction. Below are some pictures of sever wax moth damage!